The last year or so has been a very difficult time for me. In my honest and light filled moments, I can see God’s hand at work, and I know He’s doing something big. When the darkness starts to set in, like the little rain cloud in cartoons, above my head, I vacillate between feeling like God has abandoned me or in complete terror for whatever ‘big’ thing He is trying to do. My work has been to find the hope and trust inside and hold onto that regardless of how external circumstances appear. I’ve realized, recently, that a big obstacle to holding onto hope and trust is the judgment I have felt. Though some of it is a manifestation of my own struggles and the lies I believe, it has been difficult when the reason, “God asked me to,” has not been enough – even for believers. As I look back on those times, most of them have taught me crucial things, and I’ve seen God’s blessing in amazing ways. I am still waiting for the ‘point’ of some recent decisions, but I have to believe He will provide as He has in the past. I recently made a decision to do something God asked me to do. I am sure I heard Him clearly, and I fought Him, per my usual process. But only a couple of people know what I did, and only a couple more knew I was even considering it. The other day, God asked me why I hadn’t told anyone else. I had wanted my answer to simply be because it hadn’t really come up in conversation with anyone, but I knew that wasn’t really the reason. I was afraid of more judgment. From human perspective, my decision seemed impractical, and I wasn’t feeling up for defending my decision – or the feeling of failure that has been haunting me over the last year. Then God asked me why I felt like I had to defend a decision that was made in faith – made because my heart’s desire was to follow Him. There is a song by Matt Maher called Your Love Defends Me. He wants to be my defender. When I feel like I’m all alone, His love defends me. He is the strength of my soul, and He is with me in this fight. If I believe this, then I have to also believe that where I am at, my present circumstances, have nothing to do with my ability or worth – that I am not a failure – but are simply where God has me as He works in me and my environment for His perfect timing to open the next path He has for me. Almost two weeks ago, I sold my car. I had argued with Him for almost two months about the practicality of that decision. 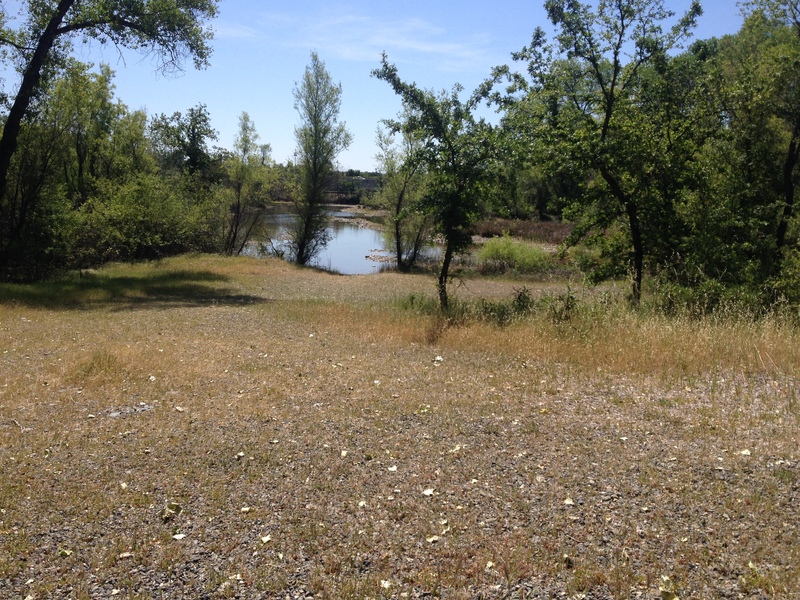 I’m in the middle of a job hunt – a need for steady income. I’m fighting depression, which gets worse with isolation. What possible good could come from selling my car? Yes, it could provide some temporary relief from the financial stress, but it would be very temporary, and I still need to find steady income. Is selling my car giving up on finding a job? This is where my trust and hope needs to kick in, and I have to hold on tight. If I believe God asked me to sell my car (which sold less than 15 hours after I listed it – by someone who drove over two hours to buy it), then I have to believe that God is going to provide. He knows what I need, and is more than capable of providing. He will either provide a vehicle in an unexpected way; or He will provide the finances to procure a vehicle in an unexpected way; or He will provide a job that I can either get to by walking or public transportation. And as I wait for that provision, I will get out of my own way and go after what I truly want – to write. I have two finished books, and about five of them floating through my head. I have given into fear as I never heard back from the first agent to whom I submitted my books. But this is what I want. I want to write. That’s the main reason I have been looking for a part time job instead of going back to work full time. I want time to write. I want to get the books out of my head onto ‘paper’. I want to believe that God wants to give me the desires of my heart. Before I begin my story, there are a few things you need to know about me, if you don’t already. I am afraid of heights (to the point of not even wanting to stand on a chair), and I don’t like being barefoot (to the point of not being able to walk barefoot on the beach or on grass). I am also a dancer, but I prefer to choreograph things ahead of time. I’ve never been very comfortable with improvisation (with anything, really, but especially when it comes to dance). These are important things to remember about me toward the end of this story. It isn’t often that I can say that I am sure of what God is doing in my life at any given moment, but there isn’t a doubt that He loves me. One of the ways I see that in my life is He communicates with me in the ways He knows I’ll understand – in the ways He knows I will hear Him and respond. Since He created me, He knows every detail of my heart and mind. He not only knows that I have a tendency to be ‘a little’ stubborn, but He completely takes that into account when He asks me to do or work on something. Throughout my life, I’ve been told that I shouldn’t argue with God. Trusting Him means just blindly following what He asks. For some people, that might work – but He knows me better than that. He knows that when He asks me to step outside my comfort zone, I will fight Him (and most likely tell Him that I not only won’t do it, but I really don’t like Him in that moment). But, unlike the many people who have told me I need to have more ‘faith’, God simply says, “I know. It’s okay. Do what you need to do. I’m not going anywhere. We’ll walk through this together.” So what often happens is that He will put a thought in my head well before He actually wants me to do anything about it, just so I can fight Him and tell Him all the reasons I can’t do it. Then, by the time He actually wants me to take that step, my heart is fully prepared for stepping into the unknown area outside my comfort zone. You’d think I’d start to see it coming, but I’m still amazed when I step outside my comfort zone and then look back and realize that He’s been preparing my heart for a while. The most recent example of that happened a few weeks ago. Actually, it began a few months ago, just before my birthday. I can’t honestly say that I fully believe those words or that everything is now magically fixed in my life, but I know something broke open when I said those words. I’m still working through the full meaning of what happened (and I know God will continue to reveal His purpose and work), but those four words coming out of my mouth caused me to connect to a part of myself I hadn’t ever connected to before. And I’ve seen the manifestation of that in ways that may not seem like much to those who don’t really know me, but they are huge. He’s been asking me to write about this since it happened. I’ve tried to use the excuse of not having time to write, but that’s not entirely true. I’m just still not comfortable with those four words, and I knew that I’d have to say them again. So He made me say them anyway. For those of you who are friends with me on Facebook, you’ve seen my updated cover photo. He made me put that there until I “found the time” to write this (though I have a feeling it will stay up for a while even after writing this…). And He’s told me that as I step deeper into those four words, they will continue to open more and more of who He created me to be. That is both exciting and scary to me, but I trust Him to be there with me (even as I throw my temper tantrums). I have been dancing more and walking barefoot more (maybe not as much as most people would consider ‘a lot’, but it’s a huge step for me). And I know He will continue to unfold His plan as I connect with those unlocked parts of me. I am worth it! I am sitting here on an air mattress looking around my ‘getting close to empty’ place knowing that I’m supposed to write. So here I am (kicking and screaming just a little bit…). It is my last night in what has been ‘home’ for over ten and a half years. As the tears that I’ve been fighting for the last month begin to flow, God and I are having a discussion about the word ‘home’. One of the dictionary definitions of the word is – the place where one lives permanently, especially as a member of a family or household; of or relating to the place where one lives. There are several things that strike me in this definition. The first word that pops out is ‘permanently’. In my life, I’ve lived in eight places that I’ve called home according to this particular definition, but, obviously, none of them have been permanent (and it doesn’t count anywhere that I’ve stayed for less than two or three months). It is interesting to me that the word permanently is used in this definition because there really isn’t anything that is permanent in this life. My permanent home will be in heaven. The second thing that jumps out at me is ‘especially as a member of a family or household’. For the last ten and a half years, I have lived alone. My little place is part of a larger house so I have had the ability to have interaction with the owners when I’ve wanted, but I live alone. Being a member of a family is a somewhat foreign concept to me. I didn’t really have that sense growing up with my biological family, but God has provided people I’ve considered family in my life. But I don’t live with those people so it’s still a little odd for me to see that as a part of the definition of the word home. It makes sense to me intellectually, it is just not something I have personally experienced. The other thing that stands out to me is just the idea of home being a specific, physical place. It is an accurate definition, but God has been talking to me about that lately – mostly in an effort to get me to access the emotions that are bound to come up when a huge life transition happens. These four walls have seen a lot over the years. From the good and the not so good moments of my last serious relationship – to helping the original owners’ son with his homework – to finding out that the original owners, who had become good friends, were moving out and watching the new owners move in. These walls have watched me dance. They’ve heard me cry. At times, they have held me up as I struggled with depression and thoughts of suicide. They saw each of my cats being brought into my home, and they watched as each cat took his last breath. They’ve witnessed the building of relationship that I had never experienced anywhere else. They’ve seen the joy and the sorrows. They’ve heard the laughter and the tears. They’ve witnessed the creative side and the analytical side. They’ve heard the unique conversations with God and watched the transformation of my life after HeartChange. They have even seen me climb a ladder or two (plus climbing on top of the fridge). They’ve heard my hopes and dreams, and they hold the memories of the first place that has truly felt like home to me. I know that all of those memories are in my heart – there is no fear of leaving those behind – and I know that God has some awesome plans for me. But there is a sadness as I think about my final night here and walking out that door tomorrow. I am leaving this home, but I know it was never intended to be permanent. As a verb, the word home means to move or be aimed toward a target or destination with great accuracy. That definition made me laugh. There’s no doubt that God is moving me toward a target or destination right now. And I can trust that it is with great accuracy. I really have no idea what is coming next, but I know He does. I am pretty sure that I’m going to be doing some couch surfing for a little bit. Part of the reason for that is He wants to continue to stretch me. Not having a long term living situation will put me very far outside my comfort zone. I’ve never really not known where I was going to be living. I’ve moved quite a bit in my life, but I always knew where I was going before I actually moved. This is new for me. I also think He’s got some things He is working out before His next ‘target’ is ready – both in my life specifically and just in the circumstances as He prepares the next landing spot for me. In some ways, I’m excited to see what God is wanting to show me during this time. Of course, it also scares the crap out of me. I’m trying to listen to Him and step out in faith with all He is asking of me right now, but it’s not easy. I’m in the process of selling a lot of my stuff. He’s taken care of the majority of my furniture already, and I will be having a garage sale in a couple weeks. He wants me to try and sell just about everything, and whatever doesn’t sell is what I’m supposed to keep. I have no idea what I’ll end up with after that garage sale. As I try not to curl up into a ball under my weighted blanket, I have had some thoughts about some things that He could be preparing me for. All of them could be really interesting, but they are also well outside my comfort zone. I’m sure that’s why He’s working on expanding the borders of that comfort zone. It will be interesting to see what target or destination He has me home in on, but I know, even when I’m kicking and screaming, He’s got perfect accuracy. Another definition of home is ‘relaxed and comfortable; at ease’. This is not always defined by four walls. I feel at home when I am with the people I care about. In my processing through the idea of doing some couch surfing, quite a bit of anxiety has come up because of how far outside my comfort zone that is. But there has also been something else that has come up – a feeling of home. I have had so many offers of a couch to sleep on. If all of this moving transition had happened two years ago – well, actually just 13 months ago – I don’t think I would have survived. I wouldn’t have had many options of places to go and may have ended up just sleeping in my car. But He knew what He was doing. The people I met through HeartChange have become family. God is showing me again and again that He has built up this community of support in my life for a reason. There no longer is only one or two people in my life that care about me. I could crash on a different couch every week for the next two months and know that each couch was ‘home’ for that week simply because the person offering is family. I can be relaxed and comfortable or at ease. I may not like the idea of not having a place of my own right now, but I won’t be without a home. And the tears of sadness mingle with the tears of joy as I am reminded that I am loved. My heart has found a home that will not be affected by the physical location of my body. For that I am extremely grateful. When I was growing up, and even into adulthood, one of my main struggles was with feeling like I was invisible. There are several stories I could tell about how that message was presented and reinforced in my life – some one time events and others ongoing situations that continually reminded me that my existence was not important enough to be acknowledged. One of those ongoing situations was Christmas Eve with my family. For as long as I can remember, my family spent Christmas Eve with my dad’s side of the family, and we spent Christmas Day with my mom’s family. My dad had a large family – seven sisters and two brothers (plus my dad’s brother who died at a young age). My dad fell close to the middle so I had some cousins that were my age and quite a few second cousins that were around the same age. Until sixth or seventh grade, we would go to my aunt’s house every Christmas Eve. My dad’s family would come and go throughout the evening, and most of them were people I would only see on Christmas Eve. My cousin and I would look at each other as people came in and ask, “Do you know who that is? Which sister/brother do they belong to?” When I was in junior high, my aunt and uncle got transferred and had to move a couple of hours away. That’s when we started hosting Christmas Eve at our house. Because I am so uncomfortable around people I don’t really know, I could have easily chosen to hide away in my room all night. Some years, I would leave for a bit to go to a Christmas Eve service just to not have to be in that environment. But for the most part, I would sit at the little island in our kitchen and just listen to the conversation that was pretty much the same each year. How many times had each sibling been married/divorced? Which spouse came in what order? Which kids belong to which spouse? There was something else that was pretty much the same each year. I could sit at that island the entire night, and not one person would say a single word to me. I would guess that if you asked most of them, including my immediate family, they would say that I was the ‘quiet’ one so they didn’t want to pressure me to talk, but it just reinforced how little my family actually knew me and how little I really mattered. I was invisible in my own home, even when I put myself in the middle of the ‘action’. That feeling of invisibility has haunted me most of my life, and though I still struggle with it from time to time, I have found myself feeling much more visible in the last year. I haven’t spent a lot of time thinking about why that is. I went through HeartChange and met some awesome people that I consider family, and they have shown me what belonging and acceptance and grace truly look like. It made sense that those things would help me to feel more visible. Last week, I realized that there is more to it than that. Those things are important, but I was missing something God wanted me to see. I was at a small group one night, and the host was asking each person if they wanted tea. When she got to me, before I could even open my mouth, she said, “Would you like some water?” I don’t like tea – I never have – but I can remember times in my past where people would ask me over and over if I wanted any tea. It seemed like I was just having conversations in my head about not liking tea because no one seemed to know that about me. But this person, after only one time of me saying that I don’t drink tea, remembered that and offered water which was what I had asked for that first time I said that I don’t drink tea. This wasn’t the first night she had offered me water (or anything else to drink), but it was the first night I realized God was trying to tell me something. I felt something that night – something I was only starting to get truly comfortable with. I felt known. I felt loved. As I listened later that night to what God was trying to tell me, I kept thinking about little things that had been happening over the last year that were making me feel known by more than just the one or two exceptions in my life to that point. The only hot beverage I really drink is hot chocolate, but I don’t like it really hot. Over the last year, I’ve had people make me hot chocolate and leave a little room in the cup to add cold water if it was too hot. People who know that I have issues with my lower back have checked in with how my back was doing as we have set up and cleaned up workshops. Multiple people know that I don’t like my foods to touch, I am a huge sports fan, and I love root beer. They are such simple things, but those simple things being known have had huge significance. I am not invisible. I am known. Even in the small things. Knowing that has helped me to step deeper into the more vulnerable and big things. I can trust that I am safe, and there are people around me who care and want to know me. As I let that sink in a little more, I realized something else. God wants to be known. He knows everything about each and every one of us because He created each and every amazing, intricate detail. And He wants us to know Him. As I sat on the beach on my birthday a little over a month ago, I watched my friends being rescued, and I couldn’t move for a while. God kept telling me to stay where I was at, and no matter how much I wanted to go and see how bad things were, I could not get up – could not even move an arm or leg. As I’ve shared that story, one response I’ve gotten is that people were glad that I listened to Him and stayed put. My response was usually, “I didn’t really have a choice. He sat on me.” His quick and adamant response was, “You always have a choice, my child.” As we talked about what happened that day, He said, “If you were not listening, if you did not know my voice – know Me – you would not have even noticed that I was there, wanting you to stay in that spot. It was your choice to hear My voice because it was your choice to know My voice – to know My Spirit. And it was your choice to stay and listen. You could have gotten up at any time, but you listened. You know My voice. You know Me. You may not understand all of it, but keep listening to My voice. Get to know Me more. Go deeper. Just as you have felt the significance of being known, I desire that with you. Know Me.” I haven’t really thought much about what could have happened if I hadn’t heard and listened to His voice that day. I do know I would have gone in the water, and I know it would have been a pretty stupid thing to do. I am glad that my heart recognized His voice, and I now have a new, vast desire to know Him more. I was never allowed to express emotion growing up. As a five year old, that message was already ingrained. I became an expert stuffer. Throughout my life, I’ve been told that I am hard to read. I took pride in that for a long time. That meant I wasn’t weak. I wasn’t vulnerable. I wasn’t stupid enough to risk more rejection and abandonment. Of course, it also meant that I wasn’t actually living. When you stuff, you don’t get to choose which emotions you feel and which ones you don’t. They all get stuffed. I may not have been vulnerable – I may not have cried (shown weakness) in front of people – but I also didn’t truly feel joy, peace, or love. God has worked mightily in my life to bring me to a point where I could feel emotions and identify them as I was feeling them. When it came to expressing those emotions, however, there was still a wall that I was fighting to keep up because I had pictures running through my head of what happens when I allow myself to express emotions, especially tears, around others. I am an experiential learner. I could hear about, or read about, how crying is natural, human, beneficial, and important in healing and relationship, but that doesn’t change the fact that my experience told me that crying only caused people to walk away. I never had someone hold my hand or put their arm around me or hold me or even just sit with me when I cried. Crying was an isolating thing for me. I was 26 or 27 years old the first time someone actually just held me while I cried. She was the exception in my life, and it was hard for me to stretch that across all of the opposite reactions I had experienced when I allowed myself to fully connect and express my emotions. Even throughout my friendship with her, there were times when others would reinforce those old messages of rejection. Then that would leave me believing my friend was truly the exception in my life, and I could never figure out why she cared – because I certainly didn’t deserve that if everyone else was rejecting me. This past weekend, I volunteered at a HeartChange workshop again. When I went through HeartChange myself, it changed my life. I keep going back because God keeps showing me more and more of how He sees me, and He keeps working in me to prepare me for His purpose. Over the weekend, someone shared a song that I had never heard before. Music is my language with God. He speaks to me more through music than any other way. And music forces me to connect to my emotions. That was the theme of the weekend for me. He wanted me to allow myself to let the wall down and trust that He had something different for me. And, boy did He pile it on this weekend! 😉 This particular song that was shared is called The Unmaking by Nichole Nordeman (check it out if you haven’t heard it…I’ve been dancing to it for days). When I heard it, I knew that it had a special significance in God’s plan for me that day. I had been fighting Him the entire workshop, knowing what it was He wanted me to do. I told a few people what God was trying to do because I really did want to trust Him, but this was an area that was so risky for me. I wasn’t sure I’d be able to handle any more rejection. Would there really be anyone there if I let that wall down and just allowed some of those stuffed emotions to come out? When you stuff emotions, they don’t go anywhere. They never just disappear or evaporate. At some point, they have to be released. And God kept telling me that it was time to take that step. But I just kept seeing the pictures in my head of people walking away or trying to fix things when I would cry. Could there be another experience for me? God kept telling me that I would never know if I didn’t try. That’s why I told a couple people about what was going on. I wanted to at least open the door to creating an environment where a different experience could be possible. On Sunday, I knew He would be pushing my buttons. He allows me to have my process, which involves fighting the step He wants me to take, but then He will gently push me off the cliff if I can’t jump. I knew the push was coming. As I sat where He told me to sit (away from the door so it wasn’t easy to bolt), He told me to look around the room. He said, “This is different than it has ever been. You know that. This is a safe place. These people are safe. You belong here.” And I knew He was right. As I sat there fighting with Him, there were people in that room who were keeping an eye on me, knowing what was happening. The night before, one person had asked me what it would look like when that wall came down and what I needed when it happened. That question almost brought down the wall right then and there because I knew, beyond a shadow of a doubt, that she really wanted to know the answer because she wanted to be able to make sure that I had what I needed so this could be a different experience. To feel that as I sat there was huge for me. I still fought, but I knew I was safe. There’s a line in one of the songs from the workshop that says, “Don’t you think it’s time?” I hear it every workshop, and God taps me on the shoulder each time. But this time, there was no tap. There was a flashing neon sign in my head. Don’t you think it’s time? I knew I wasn’t going to be able to fight much longer. I had a couple of things that I had to take care of so I did those quickly after that song was over, and then I told one of the people keeping an eye on me that I was getting close. Then I sat down and listened for a bit. I wanted to respond to what God was saying to me (there might have been a desire to yell at Him…), but I was sitting in the middle of a room full of people who were trying to pay attention to what was happening in the workshop. So I grabbed some paper and wrote my responses to God as we talked. We went back and forth for a bit before I put my notebook down. I had told Him that He was going to have to push me because I just could not jump. He stood next to me and took my hand. Then He said, “Will you jump with me?” That’s when the ‘down in the trenches’ battle truly began. I had my eyes closed because I knew that if I opened them, I would be pulled out of that space. And I was exactly where I needed to be. When I start to feel a connection with my emotions that is strong enough to produce an outward expression, I get extremely anxious. When I get anxious, I tend to move a lot. Normally, I would have left the room – maybe gone to the bathroom – so I could take some deep breaths and gain control again. But I knew I couldn’t do that. So my leg started bouncing up and down uncontrollably. It was an attempt to distract myself from that emotional connection…to once again regain control. I looked at Him and said, “Do you promise that the result will not be the same as when I’ve jumped before?” His response was, “Will you jump with me and find out?” Of course, that just aggravated me so we spent some time going back and forth because I wanted assurance that the jump would be worth it. I really had no idea what was going on around me at the time. I was filled in later, but at one point I felt someone standing next to me, and that person began rubbing my back. For an instant, I was tempted to open my eyes just to see who it was, but I knew I couldn’t because I would be pulled from that space, and I needed to be in that space. It was a little while before I finally said that I would jump. My leg stopped bouncing, I took a deep breath, and we jumped. The tears started coming, and I looked at Him and said, “Now what?” He just said, “Stay there. I’ve got this.” I heard someone say that it was time for break which meant that I had a job to do, but it didn’t register in my head. Of course, God really did have it. Someone asked me a question, and I was sure she was talking to me, and I recognized every individual word, but I could not make sense of what she was asking me. Later I realized that God made sure that I couldn’t make sense of it because if I had, I would have immediately pulled myself out of that space, gained control, and gone to do my job. At one point, I felt a hand on me briefly, and even though I wasn’t looking, I knew who had touched me and what it meant. It was the person who had asked me what the wall coming down would look like and what I needed. And in that touch, I knew that she knew, and I knew that she would do everything she could to make sure I got what I needed. I allowed myself to stay in that space and was careful to do what I needed to make sure I didn’t go back up into my head. I told someone that I needed to leave the room because I wouldn’t be able to stay in that space once everyone came back in after break. So a couple of people went to another room with me, and I did my best to allow the emotional release to continue. One of them wasn’t fully aware of what was happening, and I wanted to explain, but I knew that if I started talking, I would go back into my head, and it would become an intellectual, factual thing instead of staying in the emotional state. So I just let her be with me and pray, knowing that God was there and in control. There were a few times when I would get distracted by something I’d hear, and I would feel like I should really be back in the other room ‘doing’ things. Each time, the person with me would speak to it and tell me not to listen to that – that everything was taken care of – that I was where I needed to be. And she just held me. As she did, God brought the pictures up in my head of when people had walked away – the times that I needed nothing more than a hand to hold or a hug. Each individual picture would come to mind, and God would say, “Let her hold you through this. This is what should have happened originally.” Another person came in later and gave me a hug and held me for a bit. I know that happened because God wanted to make sure that I knew that it wasn’t just one or two people who were there for me. The whole thing was this amazing, healing process. I still have some work to do, but I can no longer say that my one friend is the exception in my life. I have found a place where I belong. I have found people who show me what unconditional love looks like. People who show me that it is ok for me to be me – without judgment or a push to change me. People who show me, in tangible ways, that I don’t have to believe the lie that says I am not good enough and I deserve to be alone. I have found family. This was where the walls gave way. This was demolition day. This is the first line of a song that I have been listening to over and over today. It’s called ‘Exhale’ by Plumb. Music has always been hugely impactful in my life. It is how God speaks to me more often than not. It is how I have connected to my emotions. It is how I process through the things I experience and learn. Over the last three or four months, I have experienced and learned so much. Some of the lessons may seem small to most, but they have completely changed my life – and honestly, saved it. 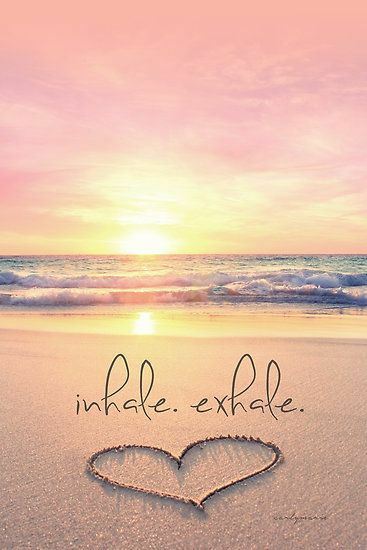 As I have been processing my experiences over the last few months, one of the things I realized is that what we inhale greatly impacts what we exhale. If we inhale toxins, we will have a very difficult time exhaling freedom, love, or joy. Throughout my life, I have constantly inhaled judgment, rejection, abandonment, and fear. With each breath, I began to build a wall. My childhood provided a strong foundation, and the wall just grew and grew as I continued to breathe in toxins for almost 40 years. 15 years ago, I met the first person who did not exhale toxins in my life. She was the exception to the rule. When she said she loved me, I actually believed it. I began to question the voices that kept saying I wasn’t worth it – that there was something wrong with me. She continued to love me no matter what, but I was still inhaling so many toxins. 3 years ago, I met someone else who exhaled love into my life. She stood by me as I began my journey of ‘detoxing’ those negative voices. She encouraged me to be myself and did not turn away or judge when I could barely keep my head above water. When I felt my life spiraling, and I questioned the point of it all, it was the love and support of these two that kept me going. If they saw something worth caring about, it was logical that I needed to find that within myself. The last few months have been about ‘detoxing’. I have been able to start exhaling those toxins from my life…the fear, the anxiety, the worthlessness. And the reason I’ve been able to do that is because I have found a group of people who have exhaled love and grace into my life. Not since dance was my entire world have I ever felt like I belonged or was accepted the way I have been the last few months. I have not inhaled even a whiff of judgment or rejection, and that has allowed me to begin to step into the person God created me to be. I am so grateful for my heartchange family. These people have (and continue to) just let go and let His love wrap around them. And when they exhale, it is a beautiful breath of only love and grace. For those of you who are constantly inhaling toxins, I pray that you find a community who begins to exhale God’s breath of life. For those who have let go and inhale God’s love, I pray that you continue to exhale into the lives of others. You may never know the lives it will save. If you ask anyone who knows me (and a lot of people who have just met me), they should be able to tell you what my favorite color is without much hesitation. For three years, my hair was purple. I have gone back to my natural hair color, but will be adding a purple streak soon. There are few days when I am not wearing something purple. I love the color. And I believe there is a reason for that. I went away for the weekend to be by myself. It’s something that I need from time to time, and it has been too long since I’ve last done it. Throughout the weekend, I kept being led to thoughts on color. It’s hard to explain how my mind works so I apologize if this starts to go several different directions. I am constantly thinking about several things at the same time, and I never really know when God is going to interrupt with a new thread. I don’t often create what is considered normal ‘quiet time’ to talk with God. He talks to me whenever He wants because I am always listening for His voice. I hear Him best when I am actively thinking about something else or when He speaks through others, not when I am sitting still waiting for Him to speak. I spent a lot of time walking today, listening to music and enjoying the scenery. God and I had some great conversation, even when I was arguing with Him, and even when I was pushing for answers that He was not willing to give. I spend the majority of my time working as a business analyst. It’s not really what I saw myself doing, but it pays the bills – and I’m really good at my job. The reason I’m good at my job has less to do with training/schooling as it has to do with how I am wired. My mind likes numbers. It likes solutions. It likes right and wrong. It likes black and white. I have always, and probably always will, look for black and white answers. But my favorite color is purple. 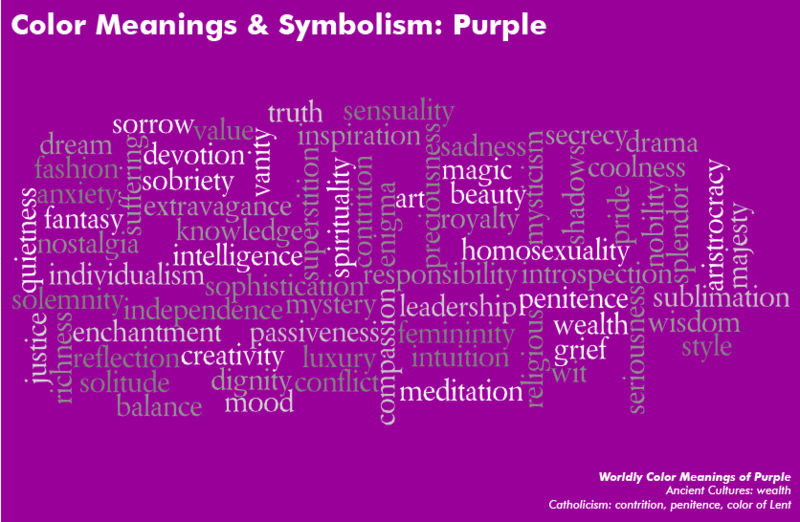 When you hear the word ‘purple’ what do you think of? Plum? Violet? Lavender? Eggplant? Light? Dark? 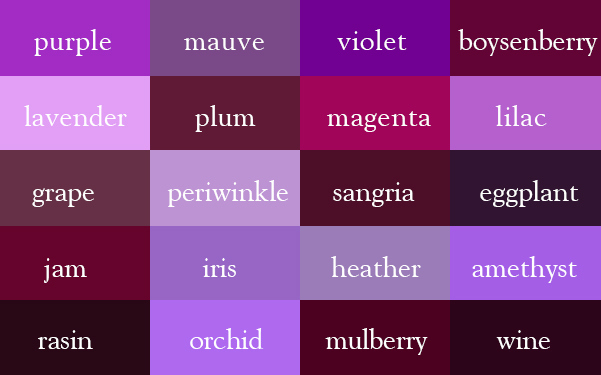 There are so many shades of every major color we think of. Have you ever tried to buy paint? Some places have color swatch books that are inches thick – every subtle difference in shading imaginable. Does it surprise you that God created a world full of people who are so unique that they can look at the same thing and think and feel so differently? There are so many shades of color because there are so many different people. God isn’t black and white. He is shades of purple…and shades of blue…and shades of green…and shades of gray. His words to me lately have been about those shades. He knows that I want a definitive ‘yes’ or ‘no’. He knows that I will always seek that no matter how much I learn or how comfortable I may get with the ‘unknown’ and the ‘gray’. I will still want black and white. And He’s ok with that because He knows my heart. He knows that at the end of the day I will follow Him wherever He leads. So He will allow me to question Him, argue with Him, and push Him for answers because, though He created me with an analytical mind, He also created me with a creative side that thrives off of shades of gray. I’ve asked a lot of ‘yes’ or ‘no’ questions lately, and His answer has been the same. I have spent most of my life trying to live up to other people’s expectations. I always thought that was what was best. I don’t really have that desire anymore. I am 100% positive that God created me uniquely, and He gave me a brain that He intended for me to use. I don’t always like it, but it has always been clear to me that God wired me in a way that most of the world will never understand. That makes me feel extremely isolated most of the time, and that has caused me to continue to try and live based off of what others think is best. And I in no way think that what is best for me is best for anyone else. There is no right or wrong. Where would God’s creativity be displayed if there was a simple, across the board, answer for what is best? I am finally starting to realize that I will never get to where I want to be if I continue to live based off of what others believe. It won’t be an easy road, but I am ready to live my life without needing a ‘yes’ or ‘no’ answer. I will still ask for them because that is a part of my wiring. But I commit to also embrace the shades of gray. God commanded us to LOVE. It is why Jesus died for us. It is what we are called to do. It means that we have to figure out a way to accept the shades of gray. Because God is not black and white.